JPEG (Joint Photographic Experts Group) is the most common image format used by digital cameras and other photographic image capture devices; besides, it is the most common format for storing and transmitting photographic images on the World Wide Web. These format variations are often not distinguished, and are simply called JPEG. Almost every one of us has a digital camera or a similar device for taking pictures. And pictures are stored in SD card, USB flash disk or hard disk with JPEG format. Maybe you are a photography enthusiast who has stored numerous valuable pictures. Have you ever encounted such a bad situation that your valuable pictures get lost fot some reason? Have you found a solution to recover those lost JPEG files without losing a single one? The article aims to find an easy and efficient way to get lost JPEG files back. Format the device that saves JPEG images: Sometimes when you connect the storage device to the computer, it reports error messages such as “The disk in drive * is not formatted. Do you want to format it now?” If you click “Yes”, the device will be formatted. Or sometimes users just do the formatting by accident, for cameras provides format function, thus photos can get lost due to accident formatting. Accidental deletion: Users may accidentally delete JPEG image files from camera or delete files by Shift + Delete from computer. Virus: If computer or external devices (SD card) is attacked by virus, then files may get lost. Bad connection: While JPEG files are being transferred to computer from camera or other devices, if you disconnects it before the transfferring is done, files might get lost. The best solution to recover lost JPEG files is using data recovery software to recover lost data. Many computer users might think that data recovery software is available to computer experts only, which, however, as a matter of fact is not true. Eassos Recovery is a piece of easy-to-use and powerful photo recovery software, which is designed for common users and supports recovering JPEG files. Eassos Recovery is very easy to use, for the whole data recovery process only needs clicking “Next” button for a couple of times. Thus it is not necessary to have a deep understanding of data recovery knowledge. Besides, this program is powerful enough to recover JPEG files. 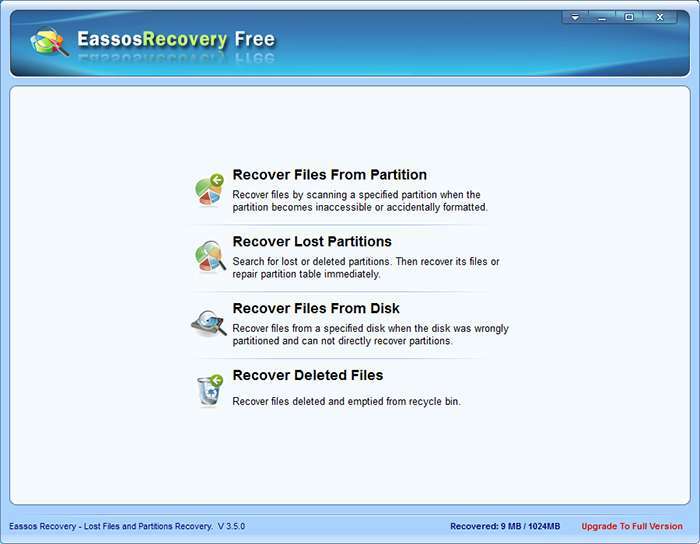 Form the main interface we can see, Eassos Recovery can deal with various data loss situations. How to recover deleted JPEG files? Install Eassos Recovery to computer or other devices. 2. Launch the program. Follow prompts of the wizard interface to scan the device what held the lost photos. 3. After file scanning is done, select files and click “Next” button to copy files to a secure path. This entry was posted in Data Recovery and tagged data recovery software, file recovery, photo recovery, recover JPEG files by EASSOS. Bookmark the permalink.